This plugin says what it does in it’s name, “The Instagram Feed Pro”. We think this is the best plugin to display your Instagram feed on your WordPress site. It’s super easy to setup and to customize the look of the feed to integrate nicely with your current site design. You can add a nice header to your feed and it will add a “follow on Instagram” button so you can increase engagement and increase your number of followers. It’s also responsive which is great for anyone visiting your site on their mobile phone or tablet. If you are looking to add a special personal touch to your website, we would recommend trying The Instagram Feed Pro. It’s great! Being the most preferred CMS around the world, WordPress has the market share of about 60% when it comes to content management platforms. What makes WordPress amazing? It’s user-friendly interface, it’s customization, it’s easy-to-install and it requires minimal technical knowledge. Since WordPress is expanding exponentially, choosing the perfect theme or plugin from thousands of options is a dilemma faced by most developers. Most businesses need a top notch website in such a competitive digital landscape, so choosing the right themes and plugins is crucial. Here are 10 key tips that shouldn’t be ignored. In today’s digital landscape, more people are using mobile devices over desktop or tablet. So, why not choose a theme that will make your website responsive. It’s important to figure out whether your theme can display content properly on different mobile devices and screen sizes. Moreover, responsive design is also a ranking factor for your website’s SEO as Google favors websites that are mobile responsive, and places them higher in search results. With the launch of various browsers, cross browser compatibility is another important feature to consider when selecting a theme. 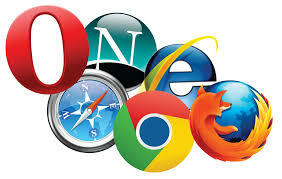 Your website visitors will use a range of browsers like Chrome, FireFox, Internet Explorer, Safari to access your site. So, as a website admin or developer, you need to make sure that your website’s UI looks the same in every environment. How does cross-browser compatibility boost your website? Designing your website to work seamlessly on all major web browsers ensures that your site will cater to a large audience. Don’t forget, if your visitors can’t access features on your website you’ll lose out on potential customers. Appealing website design is essential in the competitive digital landscape. Your website is a unique entity that reflects the philosophy, principles and nature of your business, so choosing a theme that is fully customizable allows you to deliver a website that gives the best impression of your business and attracts your target audience. How to choose a theme for your website? You should select a theme that allows proper customization of fonts, color schemes, header, footer, navigation, gallery and other components. A quality theme has various predefined built-in color schemes, easy to customize header section, image and video friendly gallery, predefined widget areas with custom formatting and styling, and allows creating a custom homepage. Why should you choose an SEO-friendly theme? Regardless of your business, your website should be SEO optimized for better drive placement in search engine results. A theme that has SEO-friendly structure is valuable because it has more potential for organic traffic from search engines. In today’s marketplace social media has significant popularity among users of various age groups. 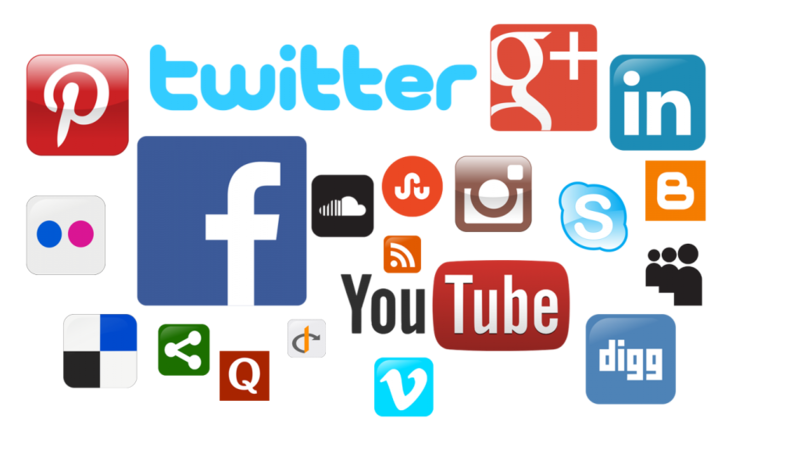 Facebook, Twitter, Google+, LinkedIn, Instagram and YouTube are the top social channels that drive a remarkable amount of traffic to one’s site. As social media has billions of users around the world, it is a proven source of potential customers for your business. To avoid cluttering your website with too many plugins, you should choose a theme integrated with social media widgets and buttons to expand your website’s customer base. The most popular way to share content is through follow, share or like buttons on posts, profiles and videos. Multi-lingual websites have become a necessity for businesses and organizations to expand. It gives a competitive advantage, increasing the client base worldwide and increasing the sales volume. Multilingual websites provide an opportunity to improve the user experience for those visitors who aren’t native speakers of your language. It also gives visitors the impression that your website is customer-centric, which helps in building trust and converts visitors into customers. Moreover, search engines also favor multilingual behavior and this ensures maximum potential for your website to be visible when searched for. Checking whether a plugin is compatible with your version of WordPress is the most important point to consider when selecting a plugin. WordPress is a fast changing environment and a plugin that has not been updated for a long time might not work properly with the latest versions of WordPress. In this scenario, the plugin can generate errors on your website or can disturb functionality altogether. When looking for a plugin for your website, focus on how many times the plugin was downloaded. Number of downloads reflects popularity of the plugin which gives a fair idea of its effectiveness. Ratings and reviews reflect the quality of a plugin. A WordPress plugin with low ratings or bad reviews should raise a red flag. 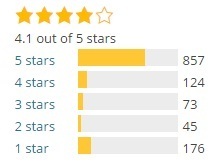 Every plugin has a rating from 1 to 5, depending on the number of stars given by the users. More stars indicate better user experience and credibility, so it is better to go for a plugin with a rating of 4 or above. Apart from the rating, it’s always best to read the reviews written by the users. A WordPress plugin that works as promoted will definitely have a good rating and positive reviews. Every WordPress plugin page has a ‘support’ forum where plugin users can post queries, leave feedback and report bugs. Everything in the forum is communicated to the author. If the forum has many unresolved threads and the author is not responding to user feedback and complaints, you might want to consider choosing a different plugin, as this probably means no one is maintaining the plugin or no one if in charge of customer support. A plugin without proper documentation will likely be difficult to install or configure. Moreover, you need to check if the plugin features are well cited in the documentation. Custom Field Suite (CFS) is a custom field management plugin. It allows you to easily add groups of custom fields to your posts and pages with several different field types to choose from including: text, date, wysiwyg, user, relationship, hyperlink and more. The plugin is simple, easy to use and supports unique features such as the ability to add front-end editing form for the title, content and custom fields anywhere on your site. If you choose to install CFS plugin, your website will need a great search plugin like SearchIQ. SearchIQ’s capability to index several custom field types will allow website users to access more content. With SearchIQ, you can also select to display custom field value in the results page description. Other benefits include improving your search engine ranking, compressing files to save bandwidth, sustaining high traffic and optimizing progressive page rendering. These factors affect your site’s rank and improve your conversion rate. How does SearchIQ compliment W3 Total Cache you ask? 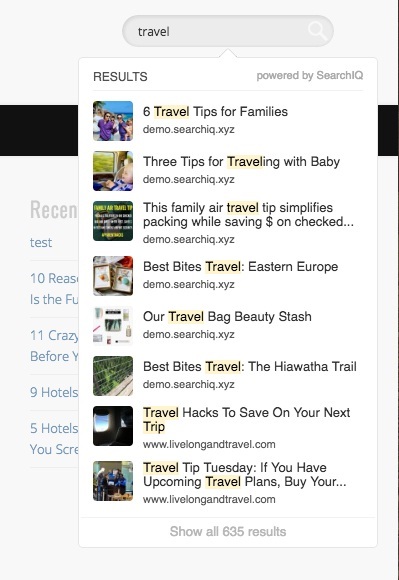 SearchIQ displays fast and accurate results, improving the user experience further. It keeps visitors on your website happy and increases browsing time. Caching your website and using onsite search is a proven performance booster. WPtouch is a WordPress plugin that makes your website mobile-friendly. The plugin adds a clean and elegant mobile friendly theme to your WordPress site automatically. Apart from the theme, the plugin also allows you to customize the appearance and styling of your website, without needing to change any code. It’s one of the simplest ways to deliver a fast and user-friendly site to your mobile visitors. Making your website’s UI compatible on mobile devices is crucial but your website still needs more. For better UX, mobile centric search is equally important and with SearchIQ you can give your users just that! SearchIQ has the most advanced options to customize the look you want for your users including search bar placeholder text, color and more. You can also add a search icon if you don’t want a search bar on your website. 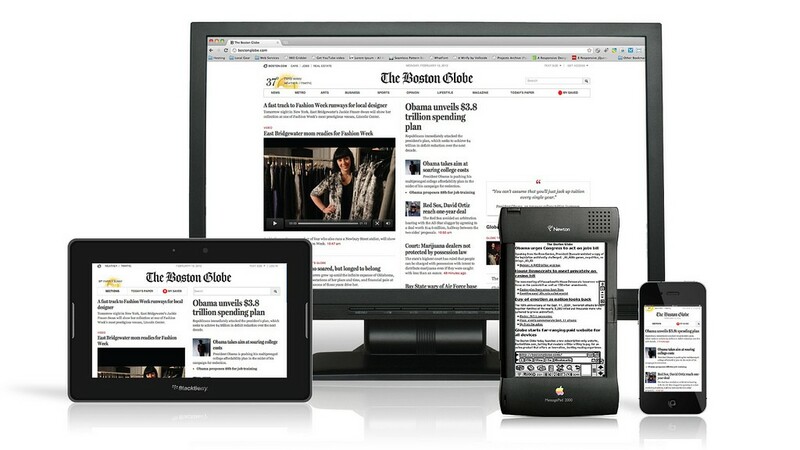 Website visitors will now have the most pleasing experience no matter what device they are using. First of all, Happy New Year everyone! We hope 2017 is getting off to a great start. To kick-off our first, First Fridays of 2017 we want to share a plugin that is useful for anyone wanting to be more mobile friendly… WPtouch Mobile. This WordPress plugin provides you with a mobile friendly theme automatically. It is also customizable allowing you to make adjustments to the look and feel of your website on a mobile device. The best part about this all, you don’t have to change any code on your website’s desktop theme for this plugin to work! It’s awesome! Require something a little more robust? You can always look into the different packages which include WPtouch Pro, business, developer and enterprise. Each one offers a little something extra, like advanced font controls and premium support. If your website isn’t already mobile friendly, you should definitely consider installing this plugin.